Easy fitting long sleeve jacket with zipper * Breast pockets with flaps and stud closure * 2 Skirt pockets *Trouser with 2 side pockets * Hip and rule Pockets * Zip fly. 50mm silver flame retardant tape on biceps and thighs. 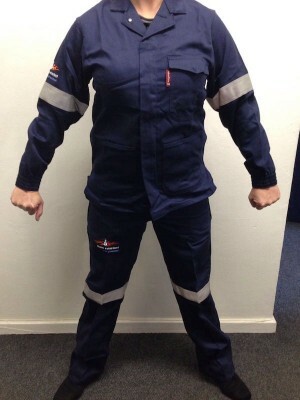 This overall / Conti suit is made specifically to satisfy the needs of the Sasol company. As with all our overalls / Conti suits, it is made to the highest quality standards. This one is a little special in that it is both resistant to acid and to flames, this gives you and the overall some protection against chemicals and also things like grinding sparks etc. Good for people working in the chemical manufacturing industry as well as other industries where hazardous chemicals are used, for welders, grinders and people working with open flames it will help protect the wearer and make the overall last longer. It also comes standard with reflective tape making sure you are always visible in almost all conditions increasing the safety factor of the overall / Conti suit. The colour being navy blue also helps hide stains and marks so it looks presentable even after years of use. IF you are looking for a tough strong long lasting durable overall with some protection against chemicals and flame this is the very best overall you can get. Because it is made of 100% cotton it is also cool in summer and warm in winter. When you want the very best this is the one to go for. It is also SABS approved so you can be assured of the quality. We highly recommend you choose this overall. You will be satisfied and the peace of mind you will have wearing it will often also impact on the quality of work you produce. Quality breeds quality. If you have any questions on this please use our contact us page to pop us and email and we will gladly help.